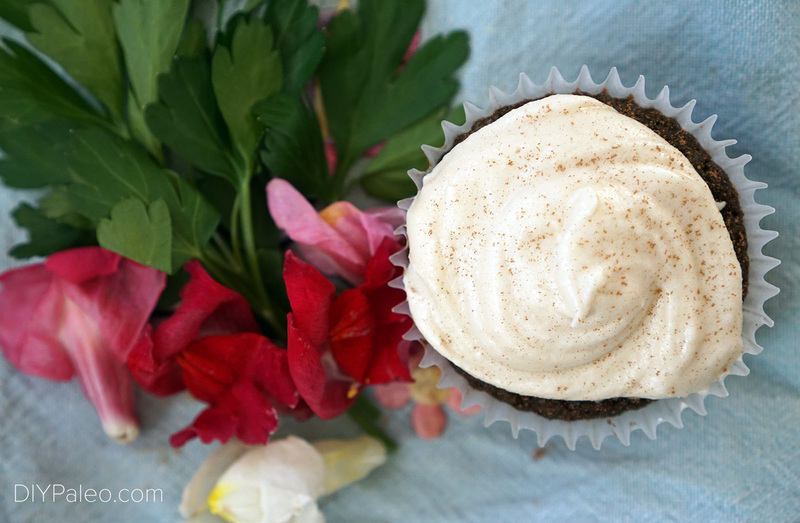 You really won’t even miss the chocolate in these decadent carob cupcakes. If you can believe it, Sunday was the first time in FOUR MONTHS that I ate a piece of chocolate. Since January, I have not so much as swallowed a morsel of cocoa. No chocolate was part of my elimination diet, and it was one of the first things that went off the menu (right after alcohol). Thankfully, going chocolate-free for a while was more manageable than I thought. Chocolate is one of those things you only crave as long as you’re regularly consuming it. I know several people, women in particular, who are fairly certain they would perish without their daily square (or ten) of dark chocolate. And I used to be in that club. Chocolate was one of those things I would eat after lunch or dinner to soothe my sweet tooth. It’s one of the only Paleo-friendly desserts on the grocery store shelf that doesn’t cost an arm and a leg. A little bit is filling–I’m not likely to eat an entire bar in one sitting. The first few days actively avoiding chocolate were strange, to say the least. I kept forgetting and almost ordered chocolate desserts at restaurants (and not just once, either). I searched the cookie aisle at Whole Foods for a solid 15 minutes looking for a chocolate-free, Paleo dessert that didn’t look disappointing and too expensive (I failed and ended up getting fruit). One thing I did not do, however, was consider carob an acceptable alternative. My previous experience with carob had been nothing but disappointing. I remembered it tasting weak, like a cup of diluted coffee. It tasted vaguely like chocolate, but it was noticeably NOT chocolate. Eating carob, I thought, would make me sad. So I don’t know what got into me at Month #3 without chocolate. I wasn’t really missing it that much. I had figured out enough other desserts like fruit with coconut whip and vanilla-orange custard (recipe to come…!) to serve dinner guests. I just decided it was time for cupcakes, and carob might make be okay in a cake situation. Had I not made the cupcakes myself, I would never have guessed they contained carob. 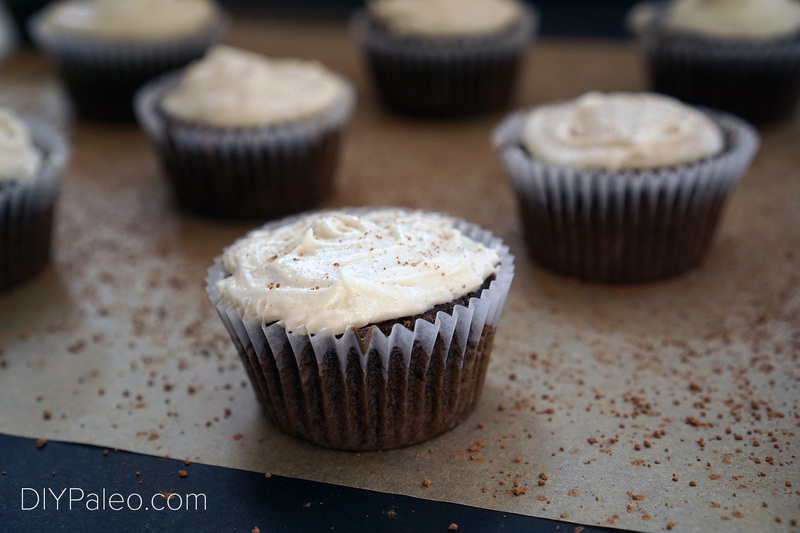 These cupcakes are nice and soft and moist—NOT your typical dry, crumbly gluten-free variety. I only used coconut flour and arrowroot starch as the flours, and maple syrup for sweetener. They’re nut-free and dairy-free. However, they’re not entirely AIP, as they contain eggs. But in my opinion, it’s the frosting that makes the cupcake. Coconut butter+palm shortening makes for a creamy, rich frosting that solidifies in the fridge and softens nicely on the counter. It’s slightly reminiscent of cream cheese frosting. I added salt and maple syrup to give this version a kind of salted carmel-esque flavor. 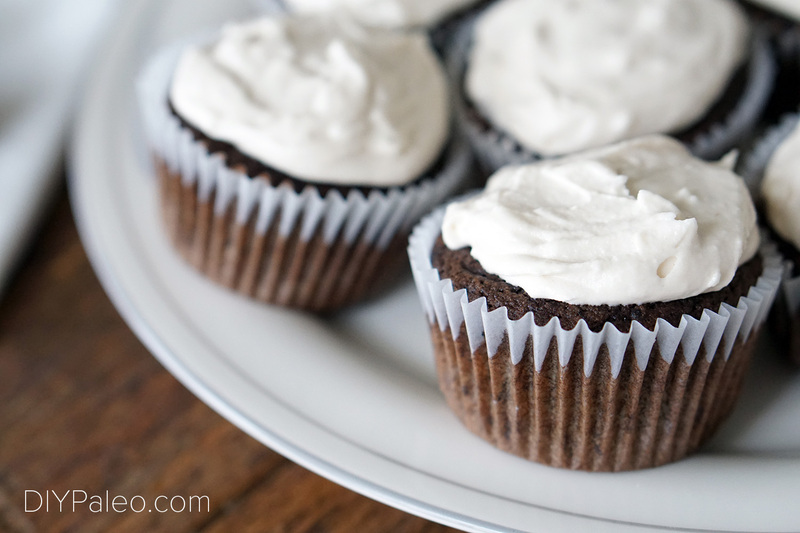 If you’re allergic to chocolate or avoiding it for whatever reason, try these cupcakes. Or hey, just substitute regular cocoa powder for the carob powder. No judgment here. You could also try the frosting with a different kind of cake. I think it would go well with pumpkin or vanilla baked goods. Beat eggs in a medium-sized bowl, then add rest of wet ingredients and mix well. Add dry ingredients to wet and mix again. Spoon batter into a muffin tin lined with paper cups, about ⅔ of the way full in each cup. Remove cupcakes from oven, transfer to a cooling rack, and let cool completely. While the cupcakes are cooling, blend all frosting ingredients with a hand mixer (if the coconut butter is too hard, place the jar in a hot water bath for 5 minutes). After cupcakes have cooled, frost with a butter knife.